I hiked the Appalachian Trail from August 20 to September 7, 2015 from Harper's Ferry, WV south to Catawba, VA. My plan was to start hiking as the southbound thru-hikers were rolling through and hike along with some of them. I actually only ran into two SOBOs, on the first night, and hiked with them. I was expecting quite a few more, but that didn't happen. This page is a recap of my three week trip. 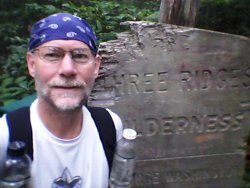 Starting with my daily blog entries, I've added a few pictures, details, and things I learned on the trail. On my hikes, I'm promoting the Boy Scouts' ScoutStrong Program to encourage youth and adults to be consistently active through their lifes. I also promote the concept of making your own gear and lightening your pack load without sacrificing comfort, saety, or efficiency. From here on, you can read about my days on the trail. You can click any picture to view a larger version of it, if you want. My Amtrak ride was a much nicer experience than I had expected. There were a handful of reasons I chose the train rather than flying. The train stops less than 1/4 mile from the A.T. so I could just jump off the train and start hiking right away. I could carry all my food and equipment with no concern of lost luggage or having TSA confiscate equipment. Even though the plane was a bit less expensive, it would arrive at night so I'd need to stay in some lodging, eat more food, and get to the trail before hiking, all resulting in more $$$ being spent. 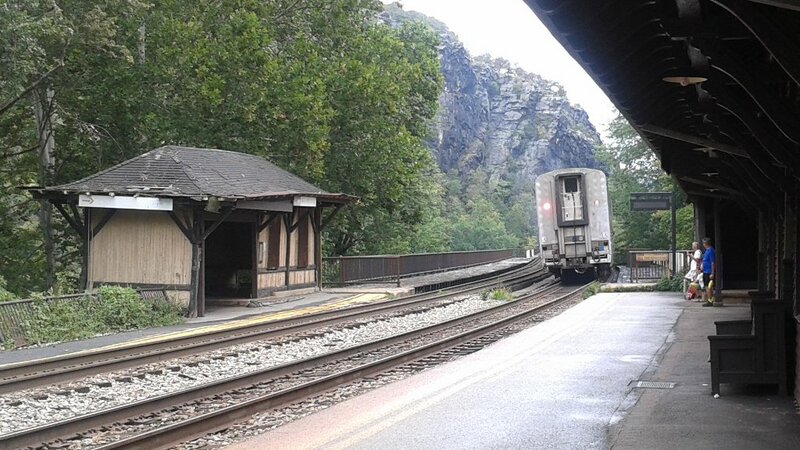 I've not had a cross-country train ride in the U.S. before, so it was something new to try. I had a seat the entire 28 hour trip, but there was lots of room and the seats were comfortable. I got to meet a lady on her way home after having been in France for a couple months, and a young lady from France on her way to visit Washington, DC. So, that made the trip more interesting. The train arrived just 1 hour late (which is very good for Amtrak) so I walked up the hill to the Appalachian Trail Conservancy headquarters. I already notice the noise of the insects chirping in the forest and the humidity in the air. I talked to Roger at ATCHQ awhile to find out if there were any trail concerns heading south and filled my two 1/2 liter water bottles before setting out. 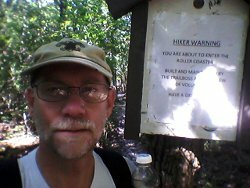 Actually, there was nothing going on at the HQ and, since I'm not a thru-hiker, they didn't want my picture so I got right on the trail. 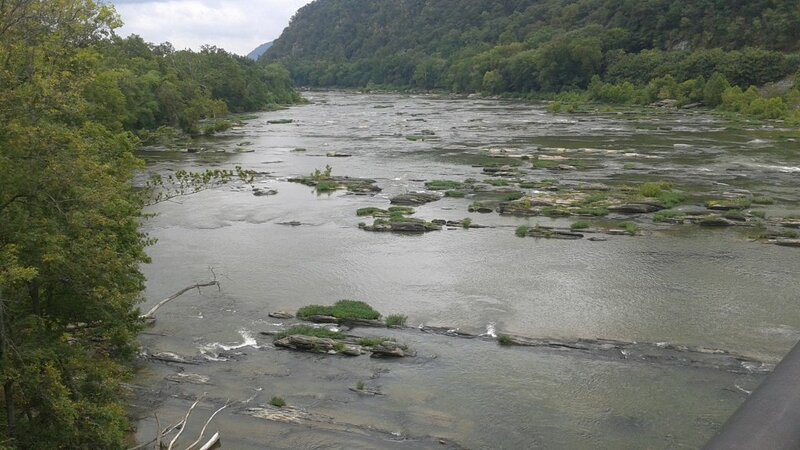 My first river crossing was the Shenandoah River right outside Harpers Ferry. Crossing on a busy freeway bridge doesn't really count as a river crossing, I guess. I then headed uphill for the only real climb of the day. The heat of the afternoon and pretty high humidity had me sweating right away. 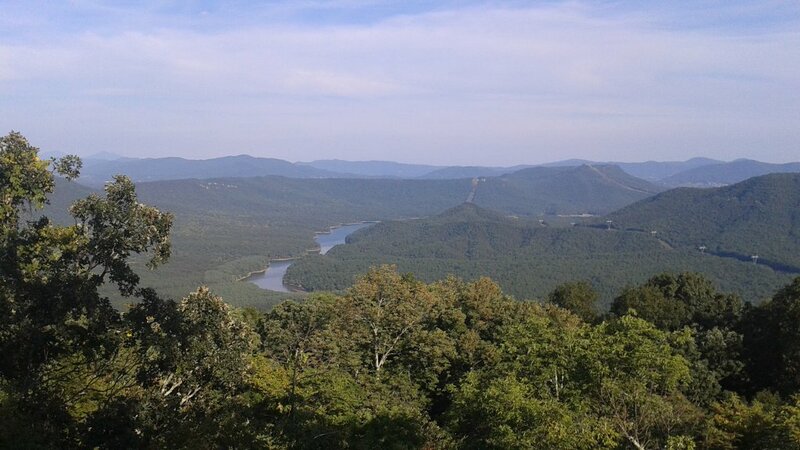 After that, it was a fairly flat ridge walk where I crossed from WVA to VA.
Now, the humidity makes drying stuff difficult and my shoes will be soaked starting tomorrow. First day was great and I hiked about 9 miles, taking 20769 steps. My two Georgia friends let me hike with them today, but they sure drove me hard. We completed the section called the Rollercoaster because it's 13 miles of up and down and up and ... Well, actually, it's not too bad because all the ups are less than about 600 feet. 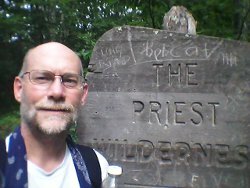 With shorter ups and downs, you get more rest than on the loooooong climbs like the 3,000 foot "The Priest" a few days ahead on the trail. I had hoped that having a section with a name like "The Rollercoaster" meant it was more difficult than other parts coming up, but I believe it is only Hard and Harder. The gang that maintains this section just decided to name it to make it a bit more interesting. 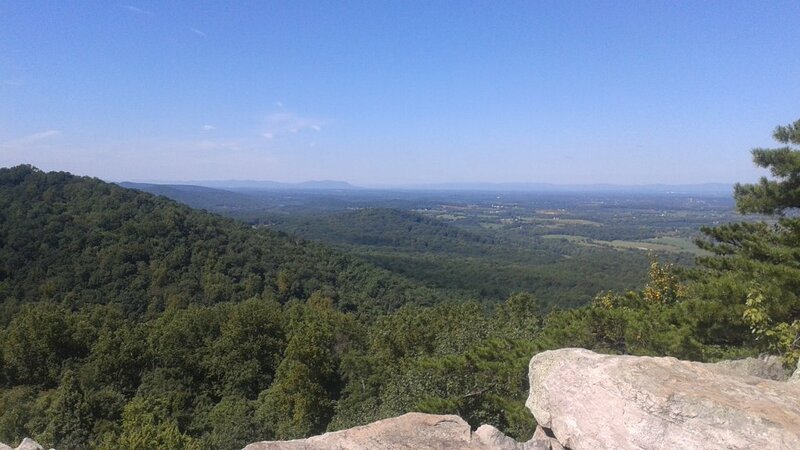 Stopped for a lunch break on Bears Den rocks. A nice overlook to the valley west of the ridgeline. 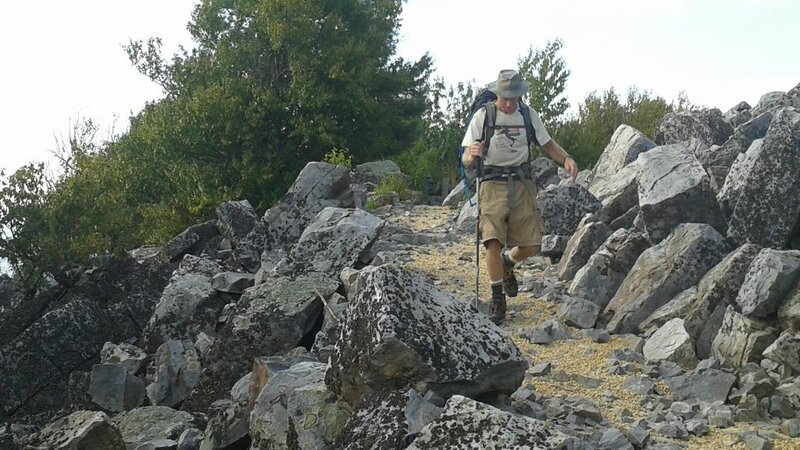 Rocky areas like this are important on the Appalachian Trail in this part because the sparce growth offers the few views out of the forest. 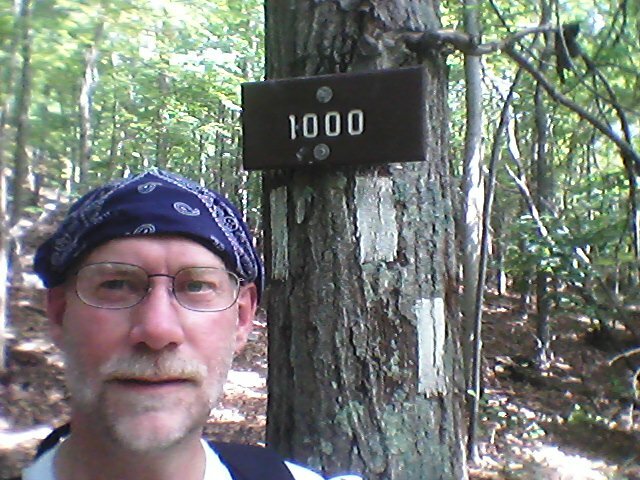 I hit the 1000 Mile mark - just a sign and rocks spelling out "1000" along the trail. For thru-hikers heading north or south this is a big deal. For me, it just meant I have 20 miles done. Water in streams towards the end of the day was bad so we kept going to the next, then the next, until we finally got to the Rod Hollow shelter, completely empty. Fortunately, the spring water here is great so it was worth the wait. I hiked 21 miles and took 54589 steps today. The step count comes from my tiny GeoPalz pedometer I wear on my shoe. It's a great way to track daily walking and they have a fun reward program to help kids get more active. "Hey, how's your hike going?" "Pretty good. Where're you headed?" "Oh, the next shelter. How about you?" "Got a few more miles to put in today. How long you out for?" "I'm doing the 40 miles from ABC Gap to XYZ Gap. Got two more days. And you?" 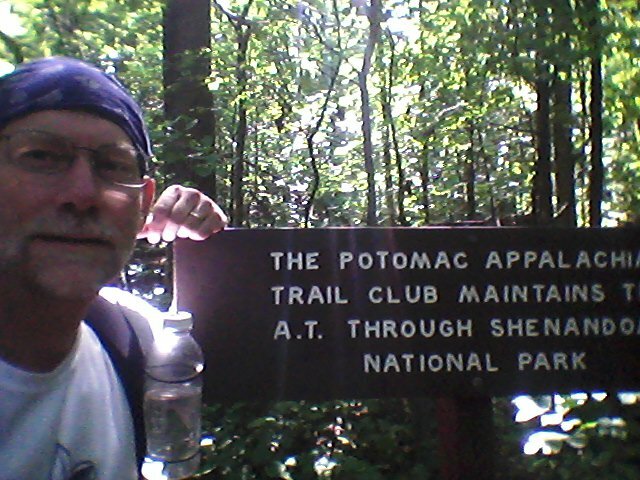 "I started at Harpers Ferry and just hiking towards Springer." "You have a trail name?" "Yep, it's Hiking Dude, or just Dude. What's yours?" "Oh, I'm just a section hiker. Well, happy trails!" "Thanks. Have a good hike." And, we turn and hike on our separate ways. I think it's interesting how the words "Section hiker" are seldom said without the words "just a" before them. Even to those doing the hiking, it's as if they feel inferior to someone hiking the entire trail at once. Seems silly to me since hiking the trail in pieces and chunks fits into life so much better than a thru-hike for most people. A thru-hike just isn't feasible for most people, and those hiking sections are out hiking the trail. I ran into one group of four weekend hikers towards the end of the day just before reaching Jim and Molly Denton shelter. They were resting midway up a long climb so I chatted with them awhile. I dubbed them "The Fredericksburg Four" because that's where they were from and they had no trail names. It was fun to visit with them a bit at the shelter and they looked like they were having a great weekend adventure. A mom and daughter are also here tonight. They are slowly heading south and learning quickly about weight and gear. They had way too many tortillas and gave me a few - mmmm, very good! This shelter was special because it has a solar shower. Now, that sounds very cool, like it's hot water from the sun, but it's actually a big bucket overhead full of COLD water. It sure was nice to rinse off the trail crud and then warm back up in the remaining sun as it dipped through the trees. The trail was fairly smooth and gentle today, allowing me to cover 19 miles in 43862 steps. 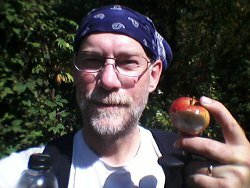 Wild apple trees along the way are close enough to being ripe that I can pick a couple each day and eat around the worm holes. I started hiking from Harpers Ferry with about 6 days worth of food. I still have over half of it left as I've had almost no appetite during the day nor when I stop in the evening. I've been forcing myself to eat something, but not nearly as much as I should be. I hope that turns around soon, or it could become a problem. I certainly have enough surplus on my body to burn for a few days, but it would be good to eat more. I have been drinking a protein powder shake as soon as I finish hiking each day and I think that has been helpful. Vanilla Thunder and A-Town left the trail this morning to resupply in Front Royal. 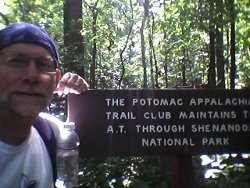 I have plenty of food, so I continued on down the trail, reaching the northern Shenandoah National Park boundary around noon. The self-registration kiosk right on the trail allows thru-hikers to fill out a permit and hike through the park. Soon after entering the park, I ran into a huge buck right on the trail. He had at least 5 points on each side and was busying himself eating apples that had fallen. Unfortunately, he didn't pose for a picture. I met a scout and his dad on the trail this afternoon. They are just starting a 100-mile trek heading south and finding the trail to be hot and difficult, like me. We chatted at a tiny spring while collecting water and they will try to reach the Gravel Springs shelter that I plan to stay at tonight. The scout is hoping to earn his 50-miler award on this trip. 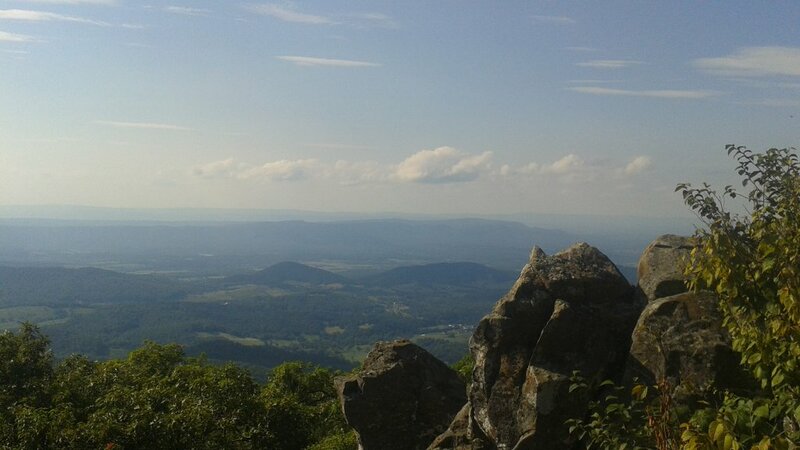 A nice view in the late afternoon from up on Marshall Mountain in the Shenandoah. Just before reaching the shelter, I crossed a road in the park. A National Park Service vehicle was parked there and I noticed a park ranger walking towards me on the trail. Said "Hi" and he noticed my BSA shirt and mentioned he was an Eagle Scout - very cool! I said I was heading to the shelter 1/2 mile away for the night. He said that I didn't need to worry, but he was out looking for people illegally collecting ginseng in the park. He had a gun. I got worried. Just then, a couple with a dog came into view a ways down the trail, in the direction I was headed. The ranger said, quite urgently, to keep on hiking and not to say anything to the people - as he ducked behind a big tree beside the trail. So, I walked on, said "Howdy" to the people as I passed, and kept walking. A bit past, I turned and saw the ranger confront them and say "Stay right here" to one of them that might have been thinking of turning around and coming my way. I didn't wait around to see what happened next. Enough law enforcement activity for me. Arriving at the shelter, after walking 45604 steps for about 18 miles, I found it was already occupied by two dads and their two kids. Owen and Ella are two very cool kids that love to explore the outdoors! It was very refreshing getting to spend a couple hours talking with them and then sharing a spot in the shelter. Owen is a scout and actually won a Scout Shop gift card from me. I put all the scout people I met on my trek (only 4) in a hat and drew him as the winner. They made more food than they could eat so I helped clean up the extras - it was the most food I've eaten this trip. And, it tasted great! We had a campfire which was nice to dry some things out. As we bedded down, I got to tell two of my favorite camp stories so I really enjoyed this evening in a dank, dirty, rock shelter with some new friends. Oh, Vanilla Thunder and A-Town arrived just as it was getting dark and camped in their tents. 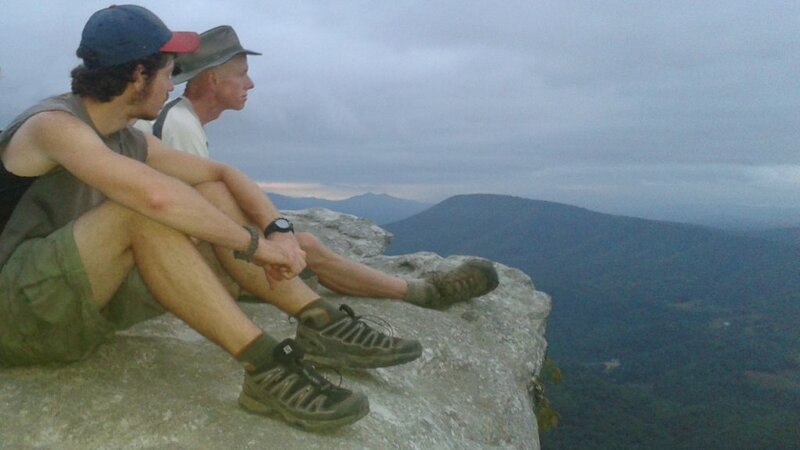 The scout and his dad doing their 50-miler did not show up tonight. But, in the morning, just as I was leaving, the dad showed up to gather water. As it turns out, they missed the blue blaze side trail to the shelter and kept hiking down the trail another mile or so. They just plopped their tents by the trail and he hiked back for water - oh, that was sad to hear. All that extra hiking. I passed their tent in the morning and I think the scout was still asleep. A great day of tiny adventures! Less than an hour into the hike, I saw a bear on the trail! Very black but not very big. He scurried into the brush and up the hillside - no picture. But, I've seen my first appalachian black bear. After six miles of hiking, I reached Elk Wallow wayside. Waysides in the Shenandoah are gift shops, grills, bathrooms, and small stores used by motorists touring along the famous Skyline Drive. The A.T. parallels Skyline Drive through the park, often crossing it in order to reach higher points and lower points so hikers don't get bored with walking on anything resembling flat ground. These waysides can be used for simple resupplying and for easy high-calorie meals that you don't need to carry, but at a price. Over the next few days, we'd visit a few of these and Elk Wallow wound up being the best in my book. 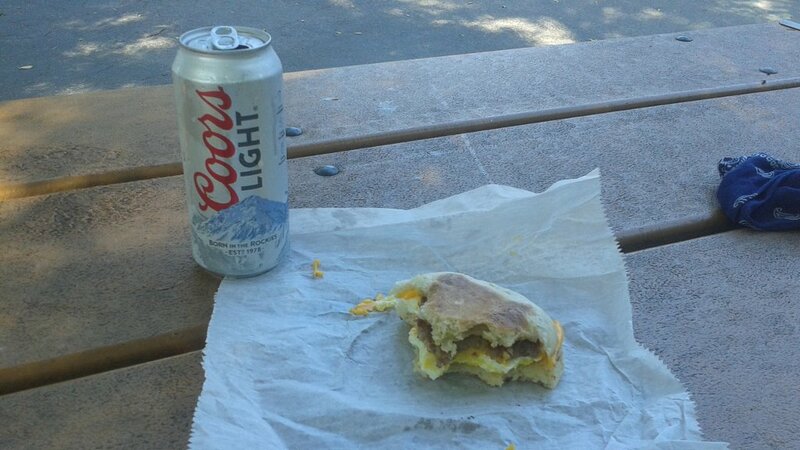 I got an egg mcmuffinish sandwich and a beer. The beer was cheaper than water and it had calories, so there you go. I also bought a big sub sandwich to pack with me for the end of the day. Late in the afternoon, black rain clouds had formed and I sure didn't want wet shoes again. Lucky for me, I had made it to Thornton Gap where US 211 crosses the A.T. and there was a beautiful rest area there. I ducked under the covered restroom area and took a long break while the rain did its thing. I made extensive use of the bathroom with hot water, pretty much taking a bath with my bandanna, and I enjoyed my big sub sandwich with cold water I didn't have to filter. Once the clouds rolled through, I tackled the final climb of the day - a 1,100ft rocky trail up Mary's Rock and on to Byrds Nest #3 hut for the night. I made the climb, not without a soggy shirt though. This view is from the top back down to the rest area where I had started climbing, and out over the mountains I've traversed the last couple days. 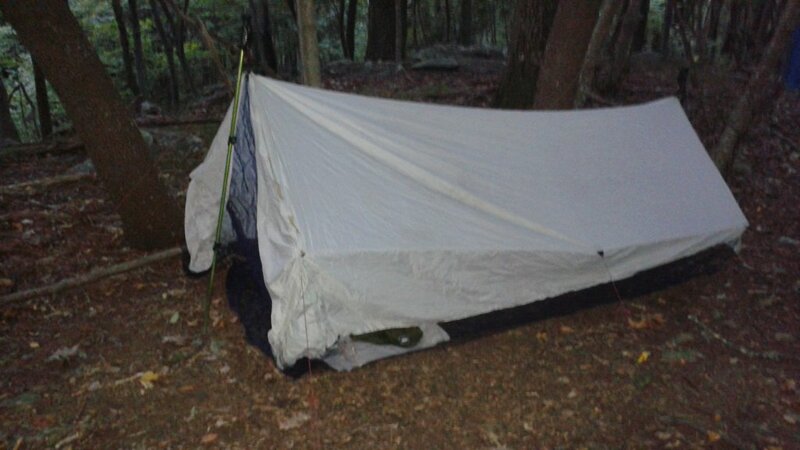 The shelter is up on a ridge so there should be more breeze, cooler, and a bit less humid. I've not been sleeping very well so far - too warm and sticky for me. I walked 44015 steps and traveled about 18 miles today. The humidity dropped today and it was nice and sunny, so my pants and underwear were actually dry for once at the end of the day! The trail along a ridge much of the day offered a few nice views of the populated valley below. Three long climbs on the trail, but I'm doing them. I can now do anything short of about 600 feet elevation gain without stopping. More than that and I need to take a short breather partway through. The legs are getting stronger for the climbing, but I'll never be able to match Vanilla Thunder and A-Town - they're beasts on the uphills. I gain ground back on any flatter sections but there are so very few of them on this trail. Two wayside stops meant easy, but expensive, food today. A-Town and I stopped at Skyland Restaurant and waited for Vanilla Thunder. and waited. and waited. Fortunately, they had open WiFi so I could take care of some stuff. Finally, he showed up from the wrong direction - he had missed the side trail and hiked 1.5 miles farther down the trail! We invaded the fancy restaurant and had hamburgers, spending way more than they were worth. Late in the afternoon, our second stop was at Big Meadow wayside which was much more useful than Skyland. A 20oz soda (more calories than beer) and a sandwich filled me up for the rest of the day's hike. 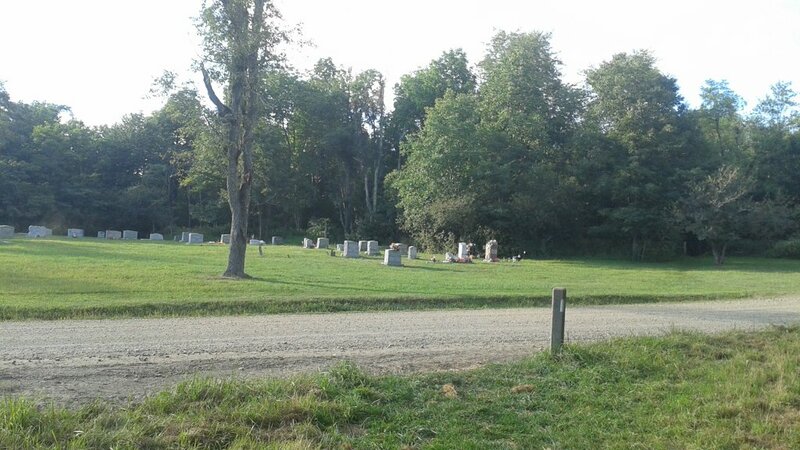 The trail took us right by a small cemetary and through patches of apple trees where deer were all but oblivious to our passing. With the delay at Skyland, the sun was setting with six miles to go to the next shelter. So, we just set up camp along the trail. My first use of my homemade shelter on this trip. I actually slept better out here tonight than any night so far. Spiders - I'm usually the first one on the trail in the morning. That means I get to bust through all the spider webs that have been spun across the trail overnight. Spiders are amazing! There are both single streamers of web that tickle across your nose, or mouth, or arms, and there are full-blown webs that you face plant into. After awhile, you start ignoring the single streamers. I once counted and hit a web more than once per minute - that's 60 an hour! On the rare smooth trail sections, I would hold one hking pole up and out in front of me to snag the webs - that helped a lot, but was tedious. One of the most glorious sights each day would be the first northbound hiker to appear - that meant most of the webs had been hit from then on. But, being over 6 feet, I would still get them on my forehead and eyes, that's why most pics of me show my bandanna on my head. Gnats - around 11:00am or so, as the day warms up, tiny gnats become active and accompany you on your hike. They flit and buzz right in front of your eyes and close to your ears. I don't believe one ever bit me, but I had a few up my nose and in my ears. One time, I completely ignored them for 5 minutes to try and figure out if it was the same bug following me, or new ones that joined and dropped away as I hiked. I never did figure it out. These guys hang around until late afternoon, when the sun would get low in the sky. No See Ums - These tiny, black dots would bite. I only got a couple mosquito bites, but my lower legs and feet were covered in small red bites after a couple weeks. This had to happen while I was resting in the shelters and the only thing I saw were noseeums. They seemed to only be out at night. Cicadas and katydids - Evidently, cicadas make noise during the day and katydids at night, generally speaking. The forest has been noisy around the clock with these guys calling their girlfriends. I've been using my earplugs at night to dull the constant chatter. It's really pretty cool sound, just too loud for me. I walked 44975 steps on the trail today, hiking about 17 miles. 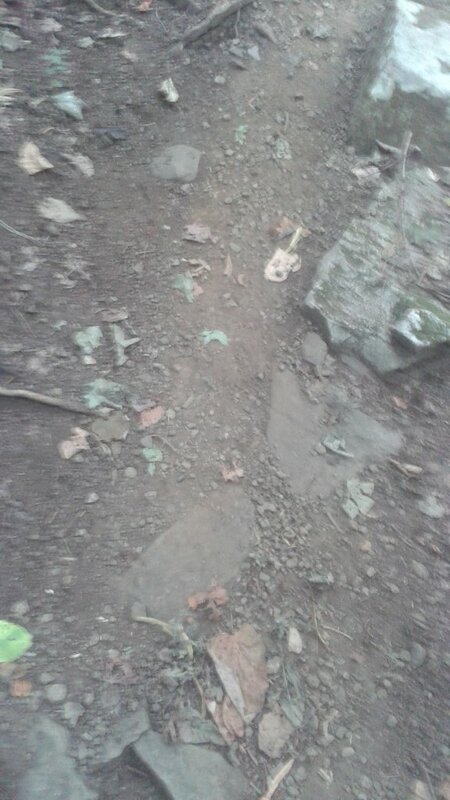 The rare smooth pieces of trail look typically like this pic. 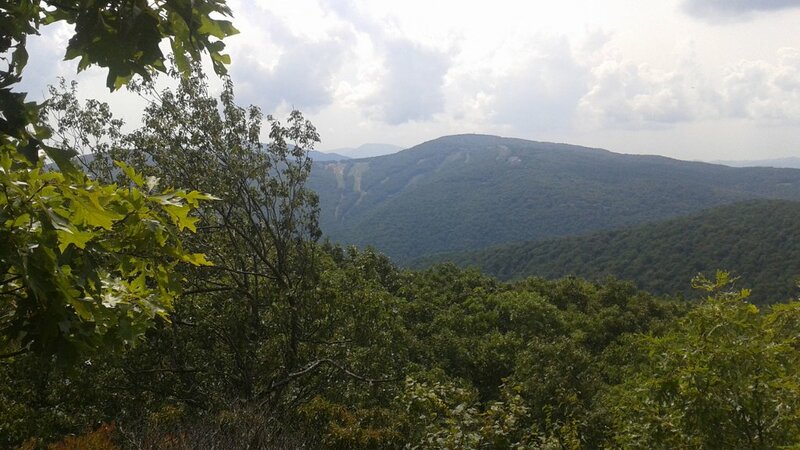 Notice the white blaze that constantly marks the way, the well-worn tread from thousands of travelers each year, and the encroaching forest that envelopes hikers all day. The highlight of the day was a stop at Lewis Campground for hot showers. Randy was running the camp store and he's an awesomely enthusiastic fella. For $1, you get 5 minutes of hot water - not a lot of water, but a generous 5 minutes. I figured I would need $2 worth, but managed to scrub fast and finish within my first 5 minutes. The store also had a good selection of resupply food. I bought a package of sliced cotto salami to take away. It made a great lunch - I ate the whole thing. I'm eating a bit better now. When I arrived at the camp store, Bloodblister was just about ready to leave. She's hiking south on a flip flop, having done Harpers Ferry to Mt. Katahdin and now doing the southern portion. We spent quite a rest break at the store and she was off down the trail. The last couple days have had unseasonably cool weather, about 10 degrees below normal, but that is due to end. A-Town hiked on ahead to meet his mom and hike a couple days with her while Vanilla Thunder and I continue on to Waynesboro. There have been many deer, but only the one bear for me. The 17 miles I covered today took 43135 steps. 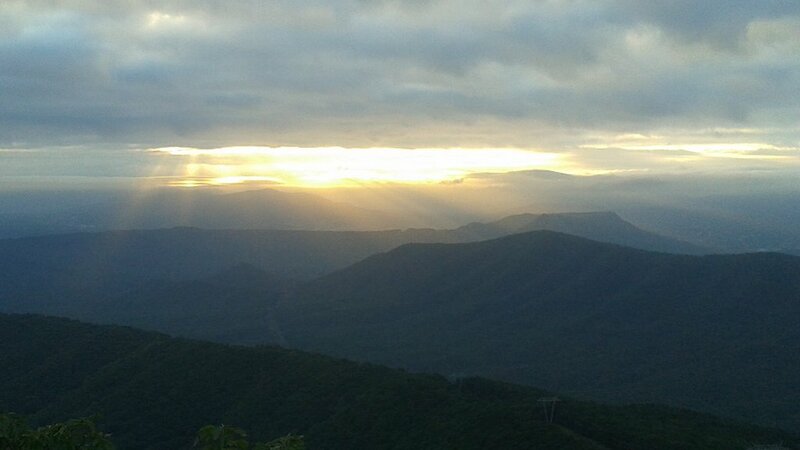 The day ended with another 1,000 foot climb up Hightop Mountain to Hightop Hut. I like the big climbs to be first thing in the morning when it's cool and I'm fresh, or at the end of the day because that means I'm sleeping at a higher elevation that night. 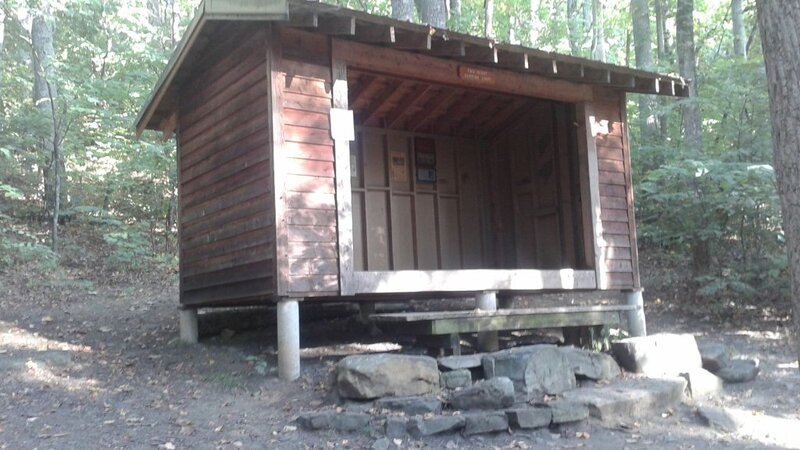 Here in the Shenandoah, the shelters are called 'huts' but are the same thing. Bloodblister is at the shelter, too. Spent the day hiking with Vanilla Thunder to Blackrock Hut on Blackrock Mountain. We saw many sassafras bushes bent over an broken off. It looks like bears eating the berries. Sure enough, just 100 yards from the shelter, right beside the trail we watched a bear crunching through the brush for a couple minutes. He moved on and so did we. Another lunchtime hamburger at Loft Mountain wayside which will be the last since we leave the Shenandoah park tomorrow. 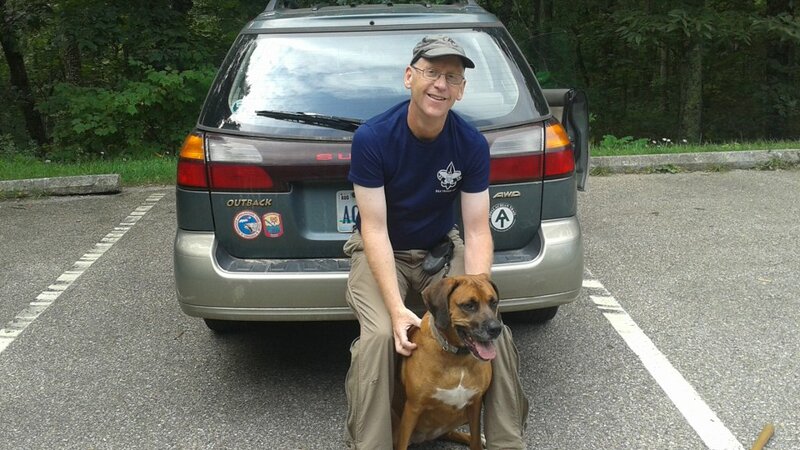 Bloodblister was at the shelter tonight, as was another hiker I met today named Barred the Changeling. He's an interesting guy, and provided us with an exciting evening. The trail roster in the shelter mentioned a huge rat living here. Sure enough, when it got dark, he came out. Big guy! Barred had his bed laid out in the upper level of this two-story shelter. He asked me to hand him a hiking pole so I passed one of his up to him. By the light of his headlamp, he battled the rat around the rafters. He parried, he thrust, he sliced, he dodged, and he finally brought the pole down with a might crunch to the rat's skull. He flipped the carcass to the ground and then tossed it out into the night. What an epic battle it was! I walked about 21 miles in 54496 steps today. 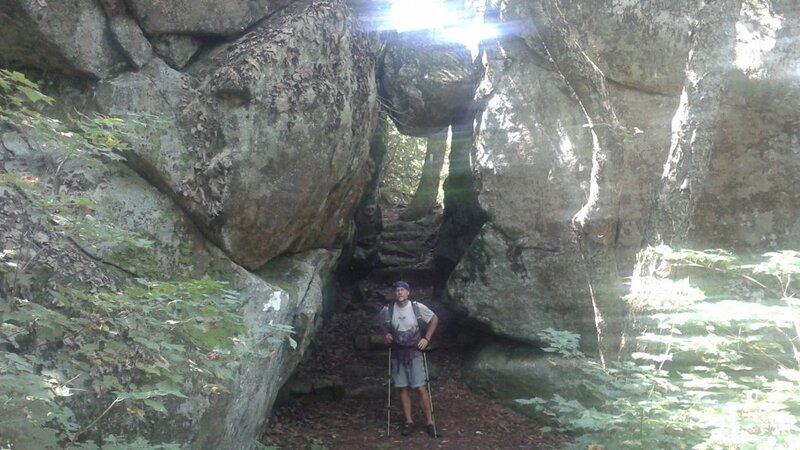 Jeff is a scouter from Charlottesville and was out doing trail work as I hiked by. He had heard that Hiking Dude was out and was hoping to run into me today. That was fun! His dog, Gracie, was along helping him out. So, we walked back to his car and chatted about scouts, hiking, and all that. He gave me a cold Coke that was just awesome, and I gave him a sticker. 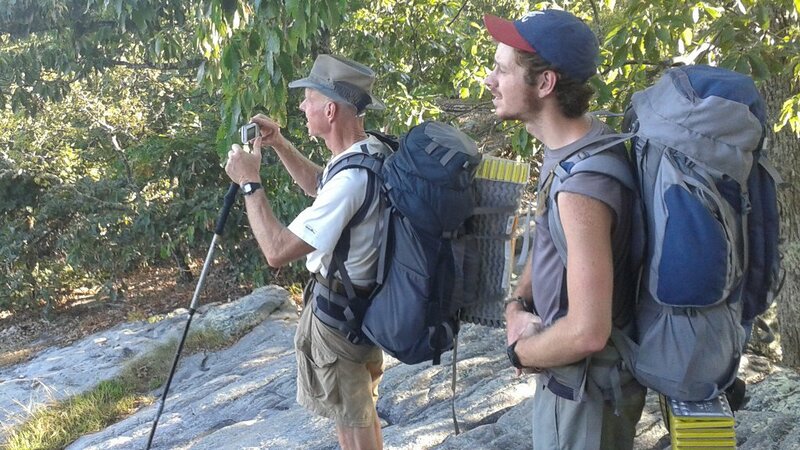 Jeff is yet another example of people passionate about caring for their part of the Appalachian Trail. Many people that hike the trail may not understand how much effort it takes to keep a trail open and usable. The thousands of volunteers like Jeff make these long distance trails possible. A-Town joined back up with us and the day finished at Rockfish Gap with a shuttle 5 miles into Waynesboro where we'll spend the night at Stanimal's hostel. The shuttle was a real experience. A guy that helps hikers gave the three of us and another hiker named Reboot a ride. His name is Dubose, but he goes by "Yellow Truck" because, Yep, he drives a big yellow truck. Actually, I believe he lives in that yellow truck - it was overflowing with stuff, all sorts of stuff, so much stuff that it took about 5 minutes to repile it so we could all get in. But, in we got, and off he drove. Guys like Yellow Truck can be found all along the trail, ready to give a lift to hikers or help them out in other ways. The load on these folks continues to grow, though. Yellow Truck said the number of hikers he's shuttled has been doubling every year with something like 400 done this year. I imagein that, at some point, it gets to be too much. Stanimal's hostel is a past thru-hiker's home that he has outfitted to house up to about a dozen hikers. Tonight, there are 6 guys here and we have a wonderful time meeting each other and hearing stories. Josh is finishing his section hike here, getting picked up tomorrow. 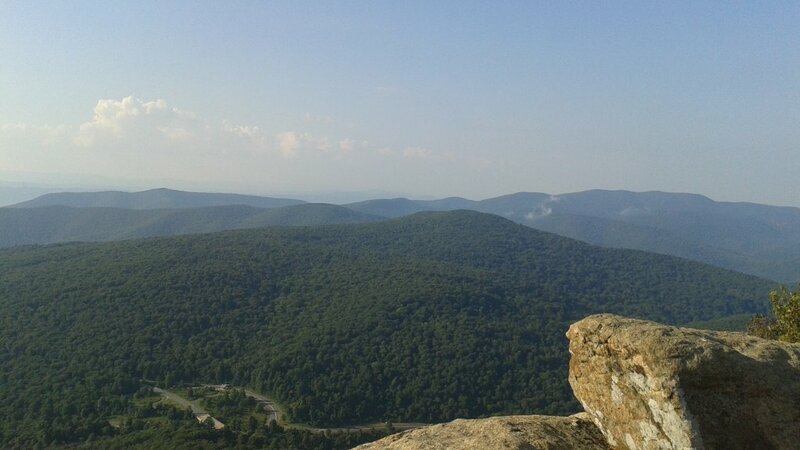 Reboot is hiking from Harpers Ferry south as far as he can, at his pace. Twix loves photography and is out exploring without much of a plan to finish this trail, or maybe start hiking west. Dana is running the hostel tonight and she made an AYCE spaghetti dinner for us for $10/each. It is most excellent, with salad, garlic bread, and even a thick chocolate dessert. Man oh man! By the way, the four most important letters you'll see in any trail guide are AYCE - All You Can Eat. 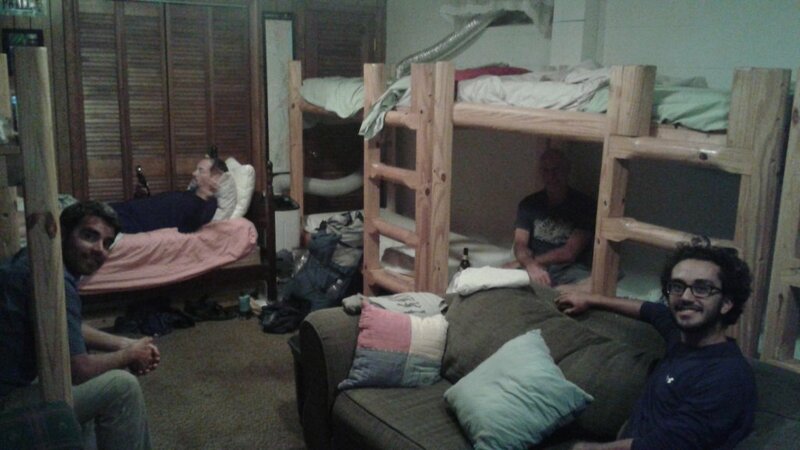 The bunk beds are clean and comfortable. I ask for the air conditioning to be cranked up and the cool air feels super. There is quite a selection of old favorite movies, and a fridge full of snacks for purchase. I walked 50580 steps to go about 21 miles today to reach this tiny bit of heaven off the trail. No trail miles today, just a relaxing day to rest, eat, and resupply. A hot shower last night was great. This morning was filled with figuring out what food I need and doing Internet stuff on Stanimal's laptop that is available for guests to use. We all piled into Dana's car and went to a local outfitter. They were surprising well-stocked and Vanilla Thunder got new shoes with the hopes that his feet will feel better. 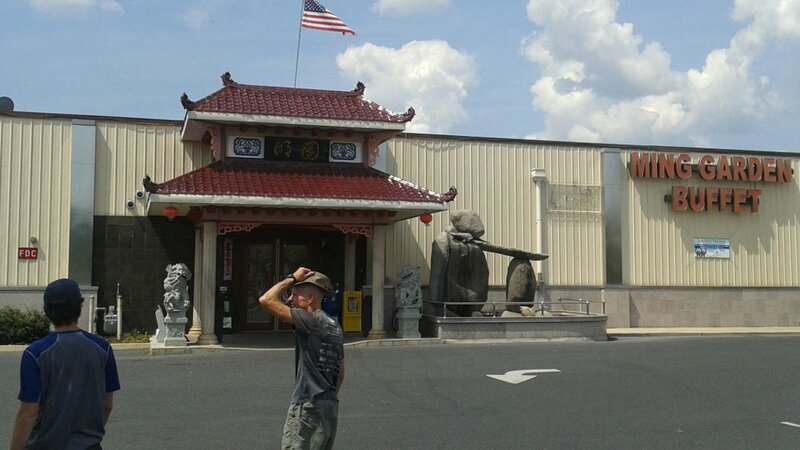 After that, we stopped at Ming's Chinese Buffet which is AYCE but it is a bit more expensive on the weekend. I enjoyed 4 plates of food, not piled to the ceiling but full enough. There was quite a spread! After lunch, a grocery store stop scored 4 days worth of food. I also got a $2 pair of flip flops because I'm about the only person without 'camp shoes'. I'm used to hiking, eating, and rolling into bed, but here there seems to be a couple hours at the end of each day around camp. Open shoes to dry out seem like a good idea. My loaded pack for tomorrow weighs about 22 pounds. The evening is spent watching movies and resting for tomorrow. 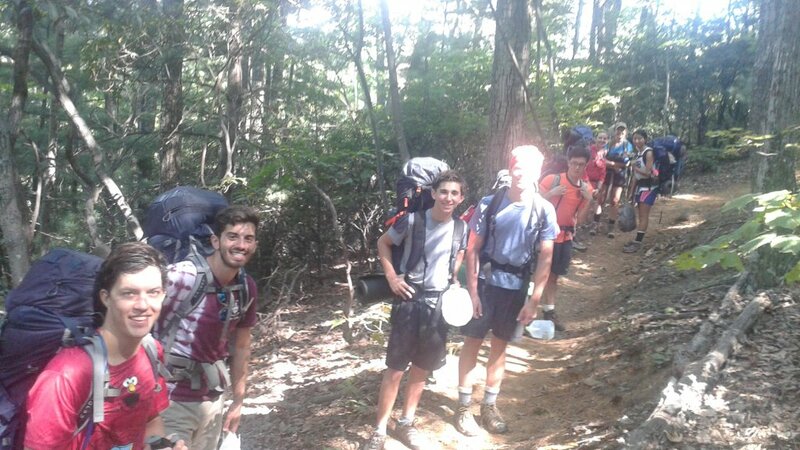 A stop at McDonald's on the way to the trail provided calories for the morning which included a 1300 foot climb up Humpback Mountain. The weather really changed yesterday and is much hotter and humid today, and forecast for the next few days. The forest provides shade, and climbing the trail to higher elevations drops the heat a bit, but it's still awful warm. The trail took us around and over the back side of this mountain with a ski resort on it. AWOL's Guide to the A.T. lists 4 reliable water sources along this stretch and they were all dry. This area has not had much rain for 6 weeks, according to a local today. So, we may be in for more dry stretches. Reaching the Maupin Field shelter, we found the spring to be a tiny trickle, but it was water! Twix hiked with us today and is at the shelter. We saw Barred and Good People slackpacking today. They might find us on the trail tomorrow. I walked 49431 steps on the trail totalling about 21 miles today. The Priest dominated this day. 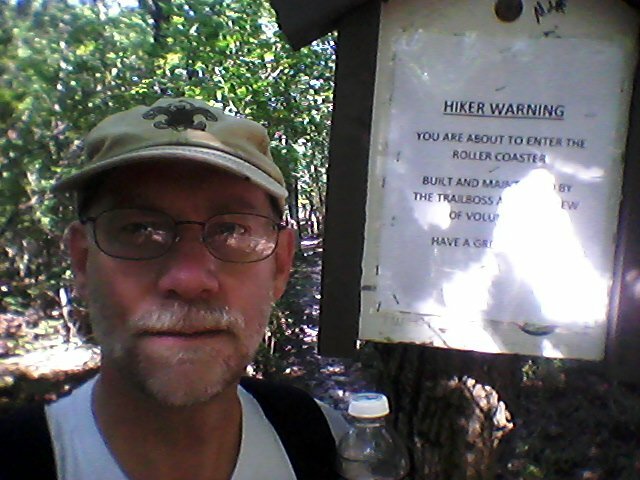 After a 1000 foot climb first thing in the morning, I had a had a 3000 foot drop over 6 miles. Then, the climb up a mountain called The Priest took me from 970 feet up to 4063 feet - 3100 feet up in 4 miles of trail, all of it up, up, up. It took less time than I expected, just plodding along step after step. 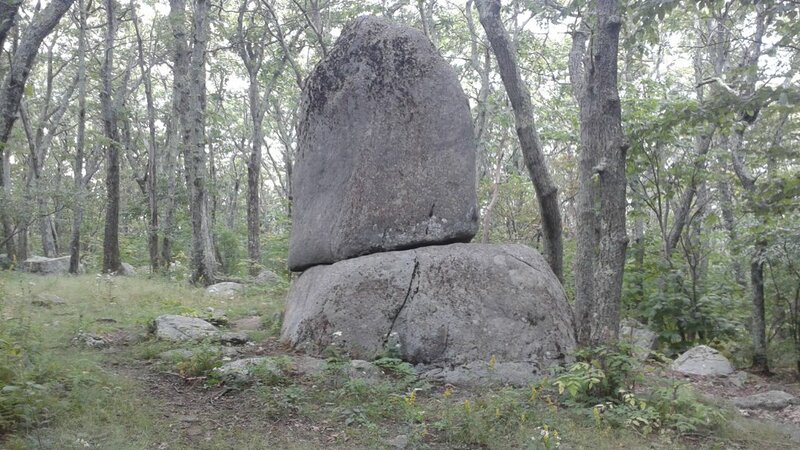 This rock was up near the top, so it might be The Priest but I don't know. The trail passed through two wilderness areas today. I'm not sure what gets to be a wilderness here since it all looks the same to me, but the signs get abused just like any other sign along the trail. A yellow jacket stung my knee. It hurt, but did not swell or get nasty, so maybe I brushed it off quickly or just got lucky. The other rough spot of the day for me was when I stopped for lunch at Cripple Creek to get water. I slipped on a rock and my shin smashed into a boulder. Fortunately, other than some blood and throbbing pain, it didn't amount to much. The end of this very long 20-mile day with 52132 steps saw me at Seeley-Woodworth shelter. There's a pretty weird old guy in the shelter, so we all set up our tents. Reboot made it here too, so it was nice to chat with him a bit. The 3800 foot elevation and a little breeze are helping to cool things off to sleep, but it's still pretty warm. There have been apple trees along the trail occasionally since I started this hike. When they can be reached, they are a nice treat - sometimes tart, sometimes sweet. Today was full of UPs and downs, but not the normal trail kind. 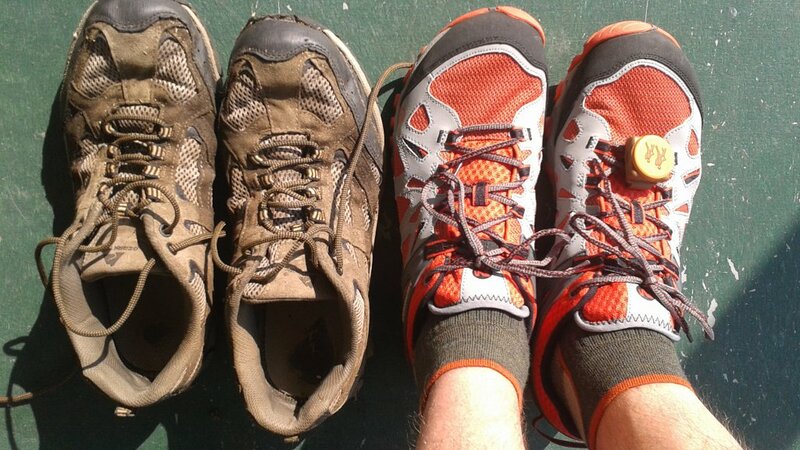 Vanilla Thunder's feet finally became just too painful so he decided to leave the trail today, after covering 1400 miles. Very sad. He's been fighting the pain since I joined him and I've been very impressed with what he's endured. We were going into Buena Vista to resupply anyway so, as we were sitting at the trailhead deciding how to proceed, a young lady we had meet two days earlier drove up. She is section hiking with her dad and gave us a ride into town. In town, at Lewis grocery, a good guy named Neil offered an idea - instead of stopping, V.T. could skip ahead 5 days and rest while A-Town and I hike to him. Hopefully, his feet will rest, get better, and he can continue when we catch him. V.T. decided to give that a shot. And then, on top of that, Neil drove A-Town and me back to the trail and then took V.T. 50 miles down the trail to Daleville. How friendly and helpful is that? 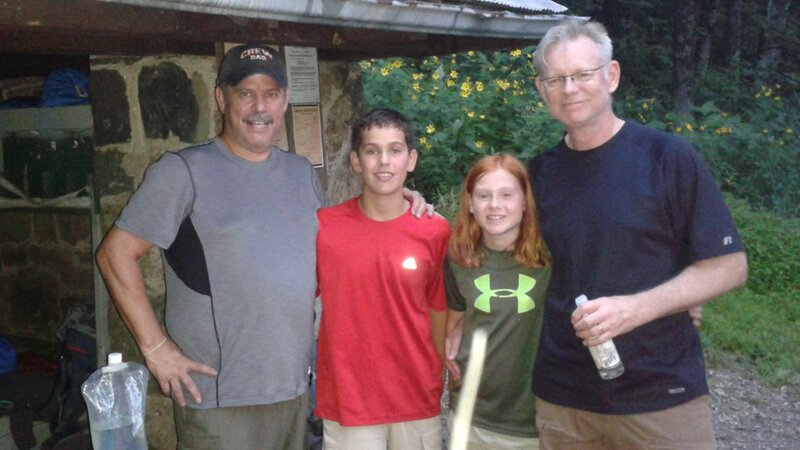 So, here we are tonight at Brown Mountain Creek shelter, having taken 37177 steps to go 15 miles, looking forward to a nice trail tomorrow and hoping V.T. 's feet improve. I'm listening to dogs howling on a bear chase off in the distance as I try to fall asleep. 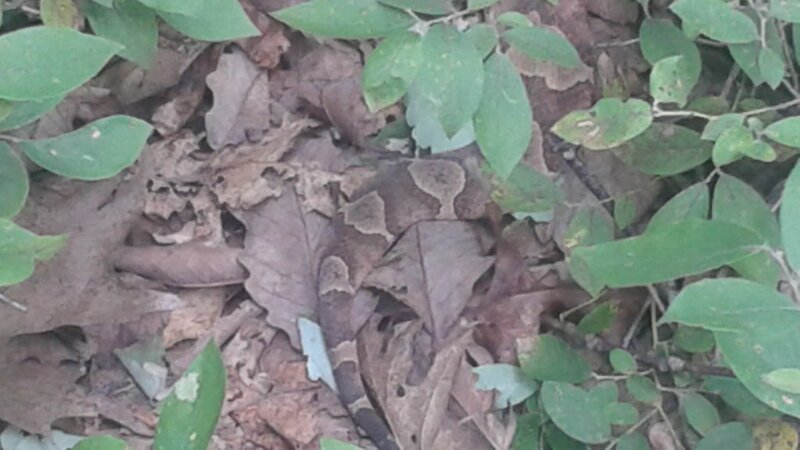 A-Town pointed out a copperhead snake along the trail. First venomous snake of the trip. Awfully hot, long day of hiking. Another day with barely enough water. There are long stretches with no water at this time of year. 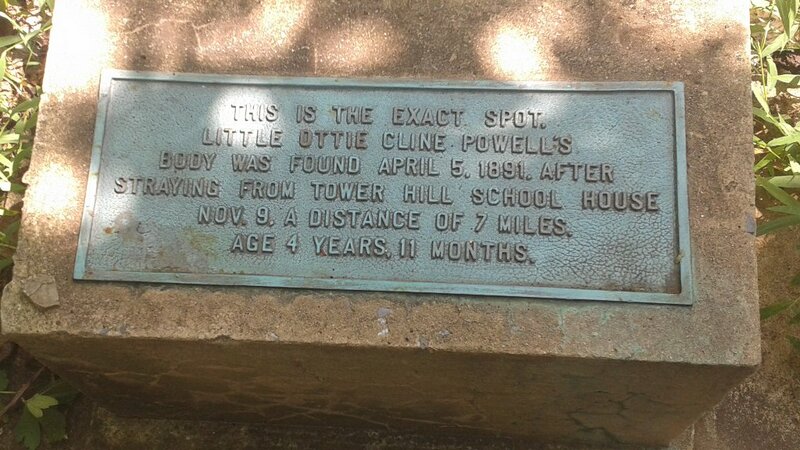 Climbed up Bluff Mountain where there is this monument to a poor little boy that died there 125 years ago. Stopped for lunch with A-Town but didn't stay long because there were flies everywhere. Other than that, I didn't see him all day. 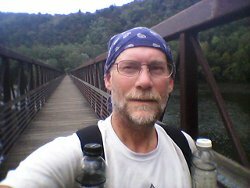 After lunch, I descended down a hot, arid, dusty mountainside to the James River where I crossed the longest footbridge on the A.T. At the far end, a young girl asked me if I'd take a video of her and her friend jumping off the bridge. I just said, "No, you'll die." My shoes are soaked for tomorrow's hike once again - oh joy! Fortunately, my feet have been doing very well, just a couple small blisters but no problems. A section hiker named Jerry was at the Matts Creek shelter when I arrived - he had beat the rain. We chatted awhile and I was afraid A-Town might have called it a day at the previous shelter due to the rain. But, he showed up just as it was getting dark. I took 51922 steps to travel about 22 miles today. My wife sent a package to Daleville for me. Yesterday morning, I realized the post office is only open until noon on Saturday. That means I have to push a couple long days in order to get there in time. Today is the second long day, covering 23 miles in 52176 steps. A-Town and I made it to Bryant Ridge shelter which is the biggest shelter I've ever seen - three stories! Sorry, but I didn't think to take a picture of it until it was too dark. It only has a small, trickling stream running by, just enough to scoop out a bit of water. I'm getting used to that kind of water now - it's actually much like water on the Arizona Trail around here. 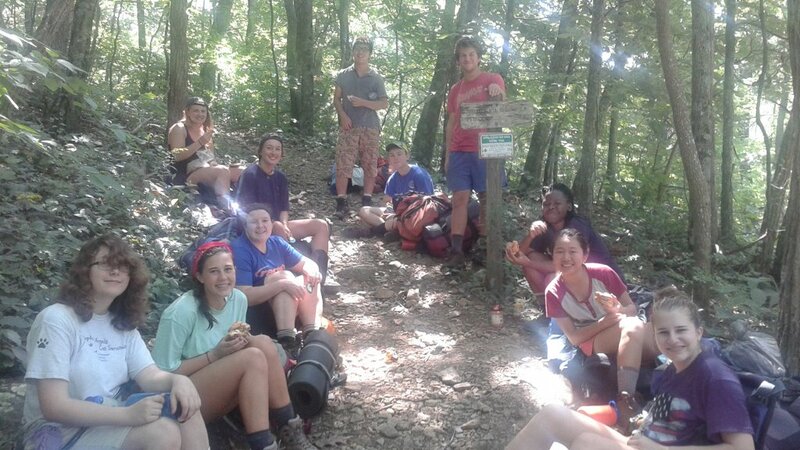 Over the past 4 days, I've been running into backpacking groups from Washington & Lee University. These are freshman groups sent out to bond and make friends just before school starts. Tonight is their last night in the woods. 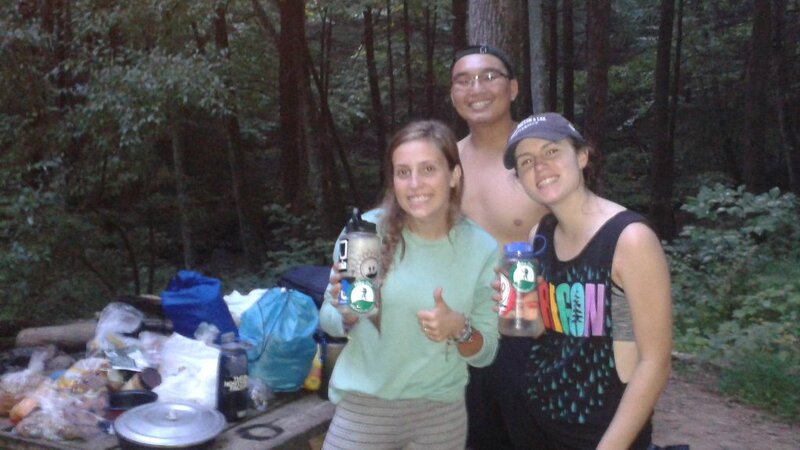 Every group I've met has been terrific, using Leave No Trace principles, being courteous, friendly, and helpful. Their leaders seem to really have things under control and the groups worked well together. These pics are a few of the groups I met. I think it's a great program they have going and I hope it stays popular for years to come. We hiked under The Guillotine today! A suspended rock over the trail. It was something I had looked forward to from the guidebook. Every day has had some small adventure in it. Hours and hours of hiking, but something interesting happens each day. Plenty of climbs today, 800ft, 1000ft, 800ft, 900ft, with tons of smaller ones in between. I'm able to push through anything under about 1000ft now, as long as the grade is not too steep. As the trail steepens, my pace changes as I slow down. I no longer consider it 'hiking' when I can reach out and touch the ground in front of me, then it's mountain climbing! This picture shows what about 80% of each day looks like. Most of the time, I'm watching a 10ft by 30ft area in front of me - looking for rocks, roots, sticks, and snakes. 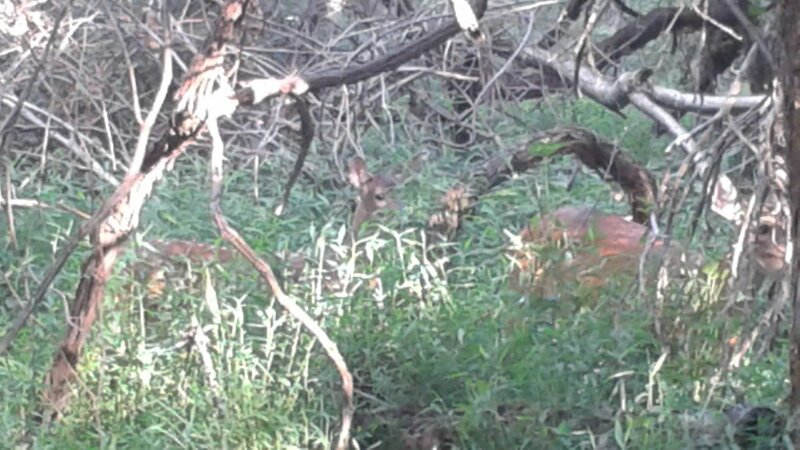 When I do look around, most of the time it is to see less than 40 yards into the thick trees. That is why the few overlooks and open places are so nice, you get to see that there really is a world outside this shadowy tunnel through the woods. There were many dayhikers on the trail and Labor Day weekend travelers on the Blue Ridge Parkway today. The road that was called Skyline Drive through the Shenandoah park is now called Blue Ridge Parkway. The A.T. follows it along the ridge, crossing over many times as the miles flow by. Most of the water sources for the past few days have been the tiniest of trickles, just mud, or completely dry. Today, I was fortunate to run into a few people with extra water. 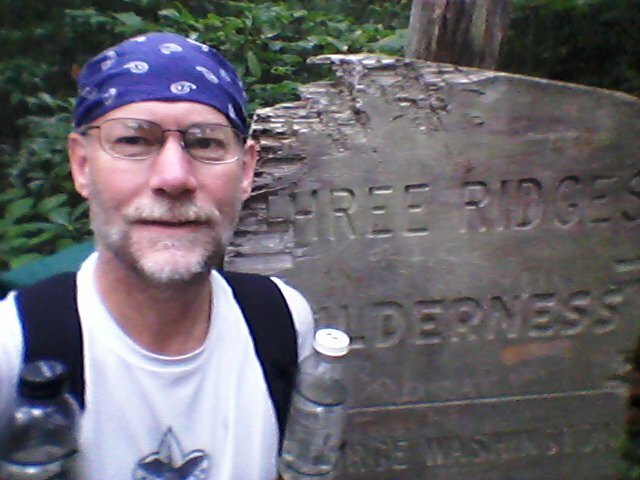 First, a dayhiker nearly back to his car gave me an extra bottle of water. Then, a group of birdwatchers from HawkCount.org chatted with me during my lunch break and gave me a bottle of water. Finally, at an overlook, a couple motorcyclists topped off my water with some extra they had in their hydration bladder. This extra water was wonderful since it was over 80 degrees in the shade. At one point during the day, I was walking down the trail mindng my own business when I heard a buzzing by my ear. It was louder than the normal gnat buzzing and suddenly, BAM! I got stung on the back of my head. It hurt a lot more than the yellow jacket sting to my knee, but I didn't actually see what it was. I took a Benadryl but my head ached the rest of the day (and actually hurt for almost a week after). To top off a grueling day, another storm rolled in as A-Town and I were doing our final climb of the day up to the Fullhardt Knob shelter. We stopped at Wilson Creek shelter to let the rain go by, but this shelter already had 6 people in it. When the rain subsided, we took off, only to have the skies really open up and the lightning start in fury. Slogging up the trail, it was actually a flowing stream. I even had to step over a box turtle in the trail enjoying the fun. I began wondering about the wisdom of continuing climbing up a mountain as the flash and boom time dropped to just 1 second. 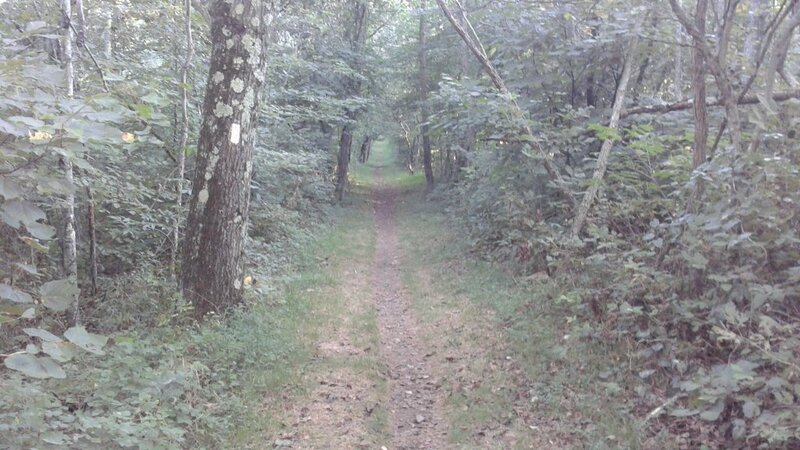 But, since the trail remained tucked into a thick forest, any spot would be as good as another. After 59384 steps and 27 miles, the shelter was pretty nice. It catches rainwater off its roof and collects it in an underground cistern from which you drain water through a spigot. Works pretty slick and there was finally plenty of water to drink after being so dry much of the day. I only walked 16041 steps on the trail and traveled about 5 miles today. A very short day off the mountain and into Daleville this morning - to 90 degree heat. This was a very tough day for me. I was out of food and the heat sapped all my energy. I have chills and I believe I got quite dehydrated - at least that's what I'm hoping. My shoes are worn out. Pain has started the past couple days in the pads of my feet, terrible headache (from yellow jacket sting or dehydration), and just all around worn down. This has been a grueling trek and I've only done about 300 miles, not 1400 like V.T. and A-town! A day to rest up is really needed. When the trail ran into US220 in Daleville, I hitched a ride a mile to the post office from a friendly couple that let me plop in the back of their pickup. I retrieved the package my wife sent, cleaned out my pack, and hiked the mile back down the road to the HoJo hotel. Got a room, took a looooooong shower, and then went to the lobby to use their computer. As I was checking on bus, train, and plane fares out of Roanoke, just in case, Vanilla Thunder and A-Town came in. I told them I was looking to go home, but they encouraged me to rest today, eat, and replace my shoes. Also, a long call to my wife was uplifting. So, I took the afternoon to contemplate life. We got some pizza for lunch, not AYCE - bummer! Then, a grocery resupply for 4 days of food. I got waaay more than I probably need, but I now have my stove and need to stay stronger. After that, I went to a local outfitter (not terribly helpful) and bought this nice, light pair of merrill shoes and some thicker socks - the hope being better support will help my foot pain. I've been eating fruit and sandwiches all afternoon and evening as well as drinking lots of water and chocolate milk. The chills have subsided finally but they come back occasionally and I've still not had to use the restroom (tmi) so I continue to drink water all night. The shoes were quite expensive but feel nice so I have high hopes that tomorrow goes well. I'm hoping we do a short day, but V.T. is stir crazy having been here waiting 4 days. It's just super that the Georgia boys have let me hike with them. I've deduced that I am really not a solo hiker - I need other people around or it's not even a little enjoyable. I told my wife that if I ever mention solo hiking in the future that she should slap me upside my head. So, if you are reading this and want to do a 1 week or 1 month trek, contact me and maybe we can go together. So, here we are. New shoes, plenty of food, and we'll see what the next couple days bring. I'm feeling somewhat rested so it's back on the trail in the morning. Vanilla Thunder and A-Town headed out on the trail before me this morning. I wasn't in a big hurry since we planned to go 15 miles to Campbell shelter. I climbed out of Daleville onto a hot, burned out ridge and my new shoes and socks felt great. As it turns out, the trail would follow this ridge in a huge 15-mile horseshoe around a big reservoir far below. This picture is looking back. Daleville is on the other side of the hill past the reservoir. I climbed up where that strip is cut out of the woods and then followed the ridge around to the left, all the way around to where I took the pic. I caught up to A-Town much sooner than I expected and then Vanilla Thunder soon after that. It was obvious that his feet were still in great pain, but he pushed on through the day. It's amazing how much he has gone through and how hard he has tried to keep going. But, later in the day, he finally decided it was no longer possible. He had done everything and the feet wouldn't work. Being a veterinarian, he compared his hike to the tough decision of euthanizing a pet - when the bad days far outnumber the good days, it's time to make the hard choice. The bad days had taken over on this hike. 40458 steps and 15 miles made up today's hike. As I mentioned earlier, I don't enjoy solo hiking for weeks. A weekend, or weeklong, trek is fine but I don't come out to the wilds to find myself, or get in touch with nature, or anything that requires solitude. 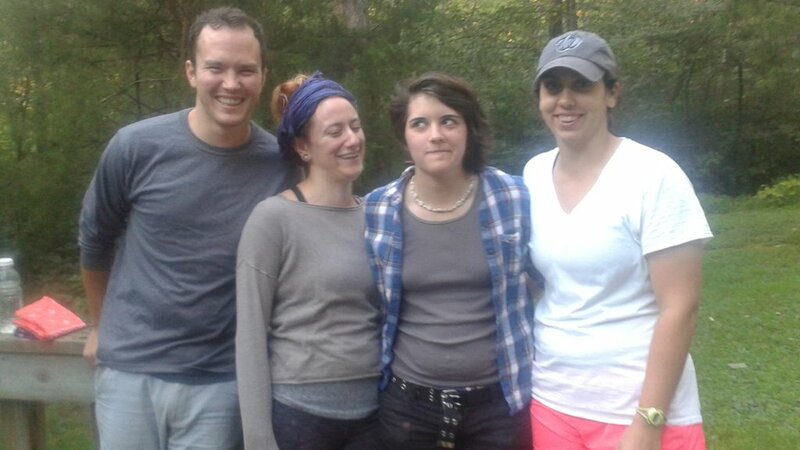 I enjoy the wilderness and sharing it with friends. The companionship and camaraderie of working together and experiencing the adventure is what I really enjoy. I don't believe I would last more than a few days hiking and camping all alone on this strenuous trail. With Vanilla Thunder leaving the trail, my options are to go on alone or hike with A-Town. A-Town is capable of doing 25+ mile days every day for the rest of his hike. I would slow him down and most likely injure myself struggling to keep up, so that would not be a good choice. The hope of other Southbounders coming along has not happened in 19 days, so I don't expect any to magically appear in the next couple days either. Since I've completed almost 450 miles of section hiking the A.T., that is enough for me. I may return to this trail in the future, but for now, I'll be stepping off and heading home. There are many other trails to explore and I hope to find others that will be interested in joining me. So, last night I had cell coverage and had my wife arrange a flight out of Roanoke for tomorrow evening. 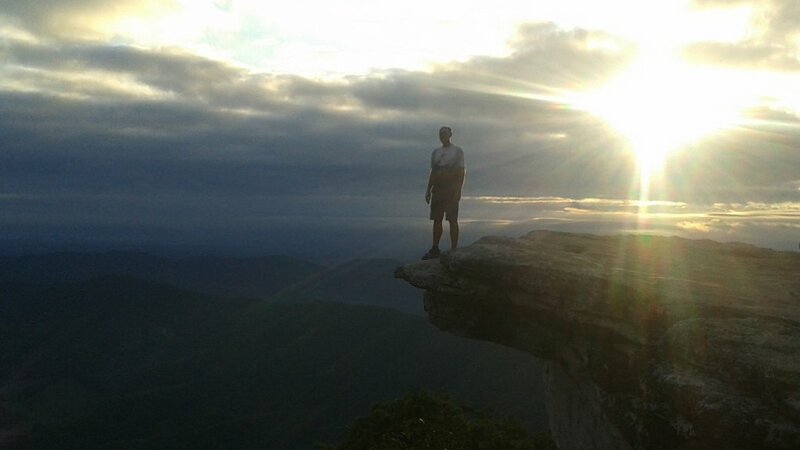 To wind up the walk, we all got up in the wee dark hours before the sun so we could climb the .7 mile to McAfee Knob and watch the sunrise. It's the most photographed place on the A.T. and we weren't the only ones with the same idea. Unfortunately, an early morning overcast clouds muted the sunrise, but it was still a nice time to sit and reflect a bit. 14731 steps brought me 5 miles to the end of my trail this morning. Last night, I contacted Homer who is an amazing trail volunteer. He arranged to pick up Vanilla Thunder and me at the parking lot where the trail crosses VA 311 heading into Catawba, VA. We got down early and he changed his plans to accomodate us. Homer contributes thousands of hours each year to maintaining the trail and many shelters along it. He shuttles people around Daleville area, and is a wealth of information. It's people like Homer that really make treks like this special - they are gems of humanity. A-Town is continuing his hike. You can check his progress at his blog and I wish him the very best on his last 700 miles. Vanilla Thunder was last seen at the Greyhound station in Roanoke, waiting for it to open at 1:00pm. He should be home by now helping cats and dogs, and their owners, feel better. And, I'm home working on my children's book and second, third, and fourth guessing myself about not hiking on a little farther. But, that's easy to do while sitting in a comfortable chair in an air conditioned house - reading through these notes and I'm confident it was the right choice for me. I guess I didn't take any pictures of all the shelters I visited, so this is pretty much what they look like. Some are more fancy, others more filthy, but all basically a roof to keep off the rain and walls to hold in the mice. Hiker Dude - we met at a 2011 Wilderness First Aid class. I've been (off & on) following your logs/blogs/journals. I'm jaw-dropping awestruck at your packweight. 20+ miles on the first days shows you were in good physical condition. I hope you get an opportunity to give the AT a third try. @Wayne - Hey! Yeah, physical conditioning wasn't really a problem, there just weren't other folks around and I didn't need 5 more weeks of alone time. I expect I'll probably only do the AT again if someone wants to do it and invites me to join them. There are lots of other trails out there to try.